I built a new version of this noisy push toy in 2016 and documented the entire process. Go read the new article for updated photos, video, and instructions! This was built to be an heirloom quality push/pull toy. It will hopefully be treasured and last a long, long time. The Jr Mower was built over the course of a 1 week vacation in early April 1998 at my brother's place in Courtenay, on Vancouver Island, BC. This is not an original design, I built this toy based on a photo that I came across. I had been planning to build a pull toy following the traditional(?) "balls in a cage" design which I had read in a book. When I came across this design I was captivated by the intricate way the clacker blocks were mounted in between the wheels. The resemblance to the old-style push reel lawnmower, which I have and use, was another strong factor in my desire to build this toy. 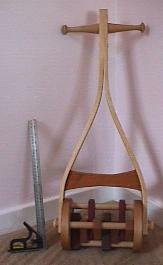 As you push this toy across the floor, the blocks of wood between the wheels swing back and forth on their dowel, and bang against the two neighbouring dowels. With a bit of imagination, the rhythmic rat-a-tat-tat sound could make you think of the whirr of the push-reel mower blades. Ok, that may be a stretch, but it's fun nonetheless. Using lots of different wood species together in this project was part of the original plan to make it an interesting item. The top handles are a pair of 5" shaker coat pegs from Lee Valley Tools. The curved body pieces were each made of 3 pieces of 1/8" thick x ~1.75" wide maple. They were soaked in the bathtub to soften them up and then bent around a form and epoxied together. 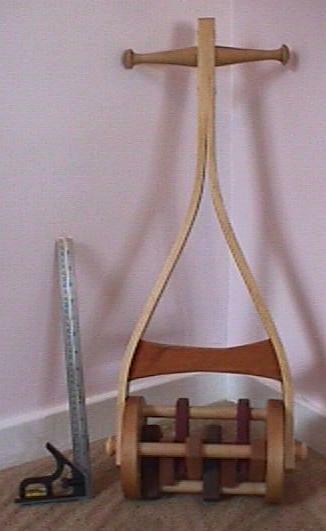 The "spreader bar" above the wheels is cherry. The wheels are .75" x 6" diameter birch. 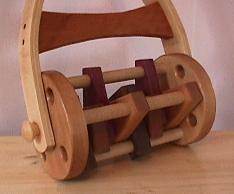 The clacker blocks ride in pairs on maple dowels. 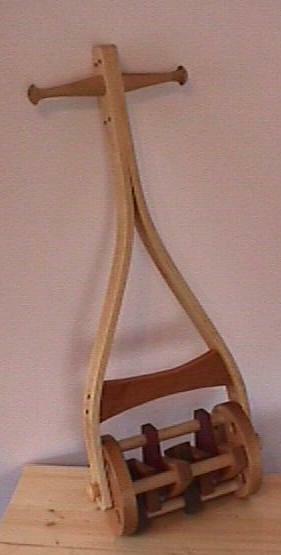 Two of the blocks are birch, two are cherry, two purpleheart and two walnut. The axles are "Smokestacks", again from Lee Valley. 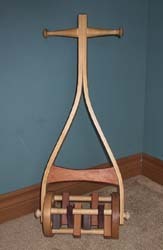 The dowels pinned at various places into the curved handles are bloodwood. Overall the Jr Mower is about 28" tall by 12" wide. (Feb 2001) Recently someone was asking some questions about this project, in hopes that they could construct something similar. During the course of that email conversation I doodled a couple of diagrams to help explain a few of the bits. I include those here, in hopes that they are interesting to some people. On the left is a close-up showing how one of the "stovepipe" axles goes through the body into the wheel. 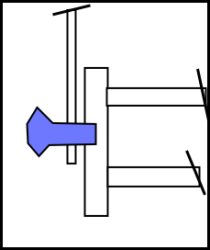 (The clacker blocks are omitted from that diagram). 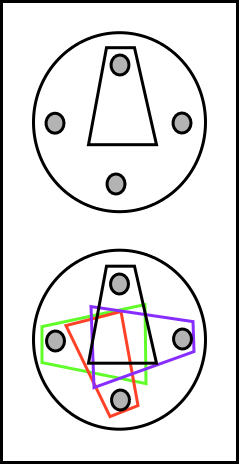 Oh the right is a side view diagram of a wheel, first showing it with one clacker block on a dowel, and then showing four clacker blocks, one on each dowel. This project was designed and built in 1998. Much later, a build article was written and published in the Nov 2004 issue of Canadian Home Workshop Magazine.